Here we summarized what is known at the present about function, structure and effect of mutations in the human prolidase. Among the peptidases, prolidase is the only metalloenzyme that cleaves the iminodipeptides containing a proline or hydroxyproline residue at the C-terminal end. It is relevant in the latest stage of protein catabolism, particularly of those molecules rich in imino acids such as collagens, thus being involved in matrix remodelling. 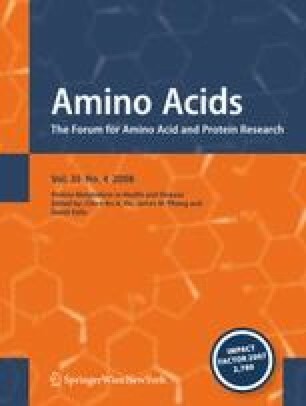 Beside its intracellular functions, prolidase has an antitoxic effect against some organophosphorus molecules, can be used in dietary industry as bitterness reducing agent and recently has been used as target enzyme for specific melanoma prodrug activation. Recombinant human prolidase was produced in prokaryotic and eukaryotic hosts with biochemical properties similar to the endogenous enzyme and represents a valid tool both to better understand the structure and biological function of the enzyme and to develop an enzyme replacement therapy for the prolidase deficiency (PD). Prolidase deficiency is a rare recessive disorder caused by mutations in the prolidase gene and characterized by severe skin lesions. Single amino acid substitutions, exon splicing, deletions and a duplication were described as causative for the disease and are mainly located at highly conserved amino acids in the sequence of prolidase from different species. The pathophysiology of PD is still poorly understood; we offer here a review of the molecular mechanisms so far hypothesized. We gratefully acknowledge Prof. Vittorio Bellotti and Prof. Giampaolo Merlini for providing the mass spectrometry technology at the “Laboratori di biotecnologie”, IRCCS Policlinico S. Matteo, Pavia and P. Arcidiaco, “Centro Grandi Strumenti”, University of Pavia, for Edman’s sequencing. This work was supported by MIUR 2006 (Grant n. 2006050235), Fondazione Cariplo and the European Community (FP6, “EuroGrow” project, LSHM-CT-2007-037471).